Climax! is an hour-long anthology series that aired on CBS from 1954 to 1958. The series was hosted by William Lundigan. Most of the episodes were performed and broadcast live. This collection includes seven of these rare TV classics, complete with original commercials for Chrysler. Disc 8 is a Shower of Stars TV show starring Jack Benny, also sponsored by Chrysler. Climax! and Shower of Stars shared the same time slot. Climax! was broadcast live and featured some of the biggest stars of the sliver screen. 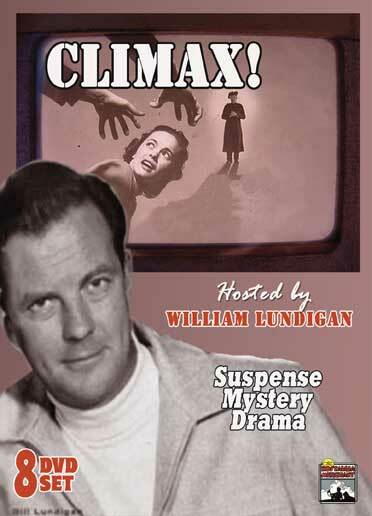 Mystery, Drama and Suspense, Climax! has it all. Another rare collection of TV classics from Nostalgia Merchant. More Climax! shows are available from Thomas Films Classics. Error in Chemistry, starring Edmond O’Brien – 12-2-54 / Huckleberry Finn, starring Mickey Rooney – 9-1-55 / Public Pigeon No. 1, starring Red Skelton – 9-8-55 / Night of Execution, starring Vincent Price – 9-22-55 / Strange Sanctuary, starring Michael Rennie – 3-28-57 / The Volcano Seat, starring Michael Rennie – 4-10-58 / Four Hours in White, starring Dan Duryea / Time Out for Ginger, starring Jack Benny.